Forging and casting are both the techniques used for forming complex shaped metal components by transforming metal materials, but different methods. 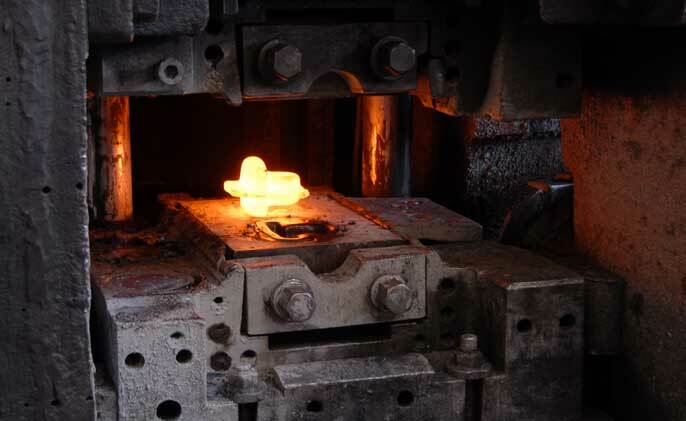 Although the working way of forging and casting is different, sometimes, the same metal components could be produced in either casting or forging. Today, we would like to discuss the differences between forging and casting, so that our customers could have a clear understanding on them, and know which process is preferred for their products. Forging is the metalworking process by putting pressure on metal billets in solid status. We could generally divide forging into hot forging and cold forging. Hot forging is the forging process that the billets is pressed under hot temperature status, in other words, before deforming the billets, they need to be heated by medium frequency furnace first. There are also different types of hot forging, including open die forging, closed die forging and roll forging. Open die forging, also named as free forging, is the hot forging method that shaping metals under the workforce of simple molds. Open die forging is specially used to produce large metal parts in simple shapes, like shafts. Tolerances of open die forging are loose, and the components by open die forging are more likely to be further machined. Closed die forging, also called impression die forging, is the popular hot forging method for small components different from open die forging (refer to open die forging vs. closed die forging). This kind of forging way is usually interchangeable with investment casting method for the same metal part, but closed die forging is better for its good strength and toughness. Roll forging is the forging process for round shaped parts, like rings, flanges, ect. 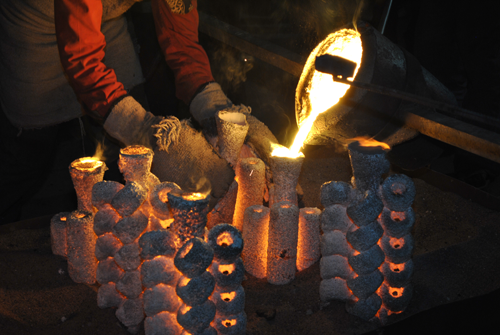 Casting is the metal forming process by pouring liquid metal into molds for shapes. Casting could be generally separated into three types of different methods. They are investment casting, sand casting and die casting. Investment casting, also called precision casting, is the casting method for precision metal components, whose fuction is similar to closed die forging. Investment casting is a manufacturing process in which a wax pattern is coated with a refractory ceramic material. Once the ceramic material is hardened its internal geometry takes the shape of the casting. The wax is melted out and molten metal is poured into the cavity where the wax pattern was. The metal solidifies within the ceramic mold and then the metal casting is broken out. This manufacturing technique is also known as the lost wax process. Investment casting was developed over 5500 years ago and can trace its roots back to both ancient Egypt and China. Parts manufactured in industry by this process include dental fixtures, gears, cams, ratchets, jewelry, turbine blades, machinery components and other parts of complex geometry. Forging have a generally higher strength and are typically tougher than metal processed in castings. The metal is less likely to shatter on contact with other objects for example, making forging highly suitable for items such as swords. This increased strength and durability is a result of the way in which the billet is forced into shape — by pressing or by hammering — during the forging process. The metal’s grain is stretched by this process, and ends up aligned in one direction, as opposed to being random. Following the pressing or hammering, the forging is cooled in water or oil. By the end of the process, the metal is stronger than it would have been had it been cast, for example. A forging’s strength isn’t consistent all the way through; instead, forgings are anisotropic, which means when the metal is worked on and deformation occurs, the metal’s strength is greatest in the direction of the resulting grain flow. This results in metal forgings which are strongest along their longitudinal axis, while in other directions, the forging will be weaker. This differs from castings, which are isotropic and therefore have almost identical properties in all directions. Since the process of forging is controlled and deliberate, with each forging undergoing the same steps, it’s typically possible to ensure a consistent material over the course of many different forgings. This is in contrast to casting, which is more random in nature due to the processes used. But forging has limitations on sizes. During the forging process, it’s more difficult to shape the metal, since forging occurs while the steel is still solid, unlike in casting where the metal has been reduced to its liquid form as part of the process. Since the metallurgist working with the steel will have more difficulty altering the metal’s shape, there’s a limit on the size and the thickness of the steel which can be successfully forged. The larger the metal section being worked on, the harder it is to forge. Ideal method is by producing small quantities. conductors into slots in iron armature for electric motors, wear resistant skins onto shock resistant components. But there are also disadvatages of castings, for example, defects of castings are unavoidable and worse quality than forging. Critical parts are often non-destructively tested (NDT) in order to verify internal part integrity. The most common methods are ultrasonic (UT) and radiographic testing (RT). Common specification pitfalls are to discount the effects of surface finish and machining when specifying NDT methods. For example, since UT functions by measuring reflected sounds waves, it works best on a part that is machined and has two parallel surfaces. Using UT on an un-machined surface compromises the sensitivity of the test. RT indications will change appearance before and after machining since the section thickness is reduced. The main benefit of RT is that a permanent record is created. The acceptance criteria are based upon a comparison against ASTM reference radiographs, which are rated 1 through 5 (best to worst). The SFSA (Steel Founder’s Society of America) sponsored a research project to determine the applicability of the ASTM referenced radiographs. In essence, the study had experienced ASNT Level III radiographers evaluate the reference radiographs in a blind test. This group was able to agree on the best and worst conditions (levels 1 and 5). However, this expert group could not agree on which reference radiographs represented the middle levels of 2, 3, and 4. Both of these examples demonstrate that each method has its limitations, and the purchaser need to understand these limitations. 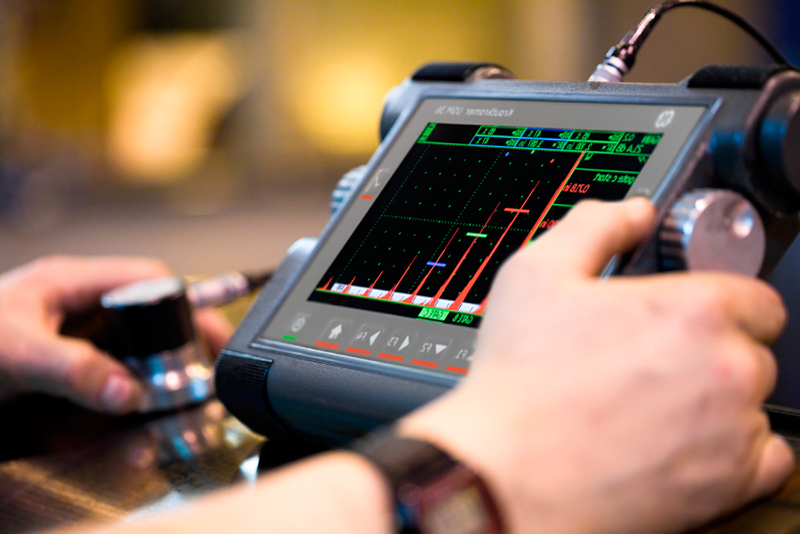 Application of a stringent NDT requirement does not necessarily result in a high-quality part. It is not absolute to say forging or casting is better? This will completely depend on what the component will ultimately be used for. Both castings and forgings have their advantages, so depending on what the component will be used in will determine which production method will serve you better. If you have questions about what type of metal component you should be purchasing for your company, contact us today! We are leaders in both casting and forging fields and have the technical authority to deliver the highest quality castings and forgings! Whatever your metal need is, we can meet it and exceed your expectations!